When daffodils start to emerge from the ground they bring with them thoughts of spring. After many weeks of much needed rain here in California, winter is coming to a close and flowers are beginning to bloom again. These daffodils are among the first to color our garden with spring by bringing a pop of yellow to the flower beds. 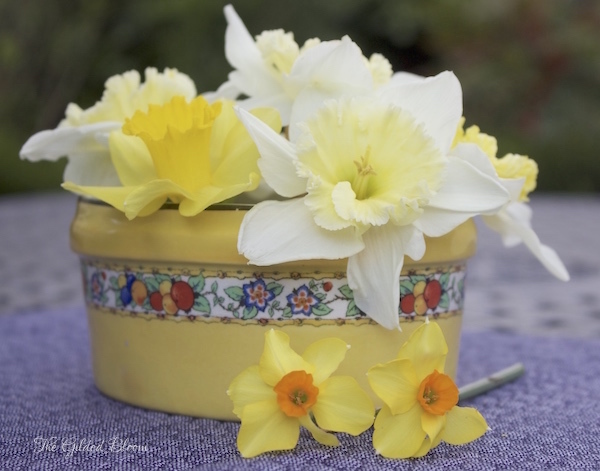 Since daffodils always make a strong statement due to their vivid color and unusual shape I decided to display them in equally unique containers. This brightly colored heirloom porcelain piece is from Sweden and belonged to my great-grandmother. It looks like a piece of kitchen crockery so I used it for a kitchen arrangement. 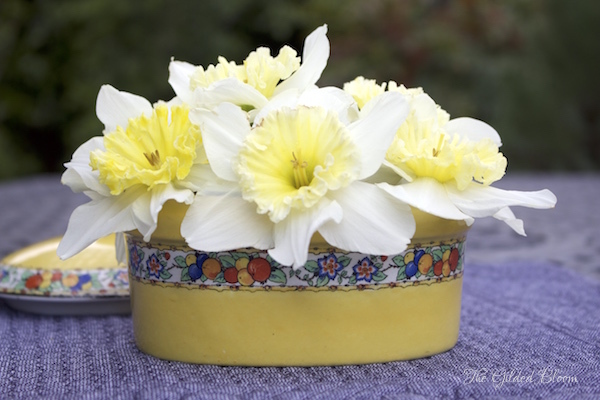 To support the flowers in this low container, I cut the stems about 3-4" and massed the daffodils into the base which was filled with water. The country style of this arrangement makes a simple statement and is very easy to maintain by changing the water daily. Mixing different kinds of daffodils forms an interesting arrangement with various colors and textures. 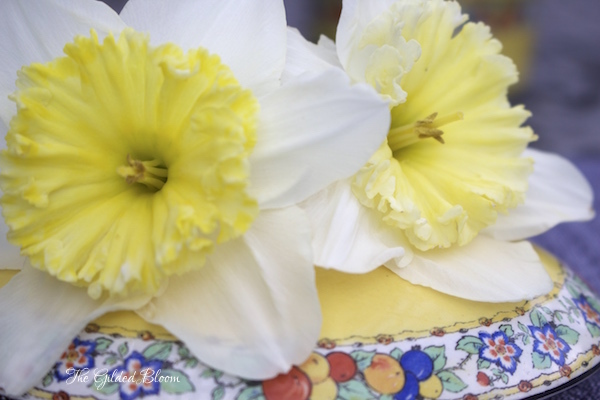 However, since daffodils secrete a sap that can shorten the life of other cut flowers, it is important not to include them in mixed bouquets unless you have soaked them in a vase of water by themselves for at least 12 hours. This will prevent them from affecting other cut flowers. 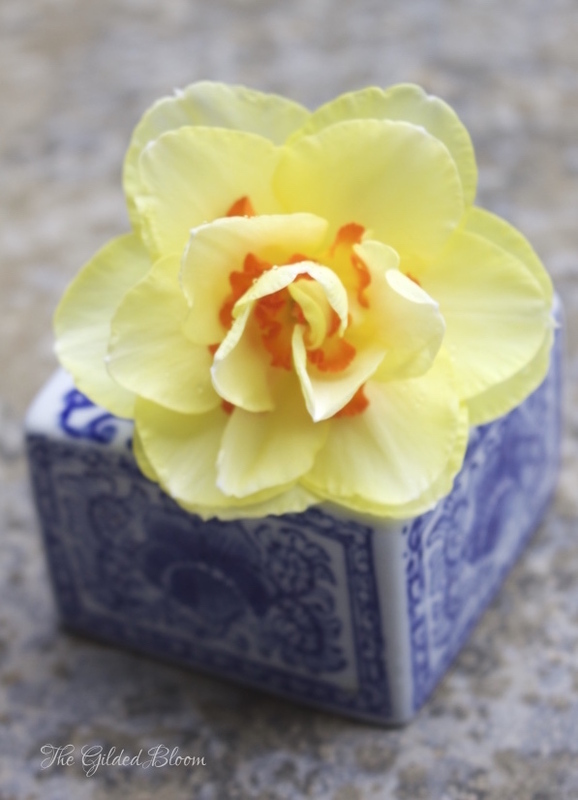 Another simple idea for styling daffodils is to use small decorative bottles or vases to hold a single bloom. 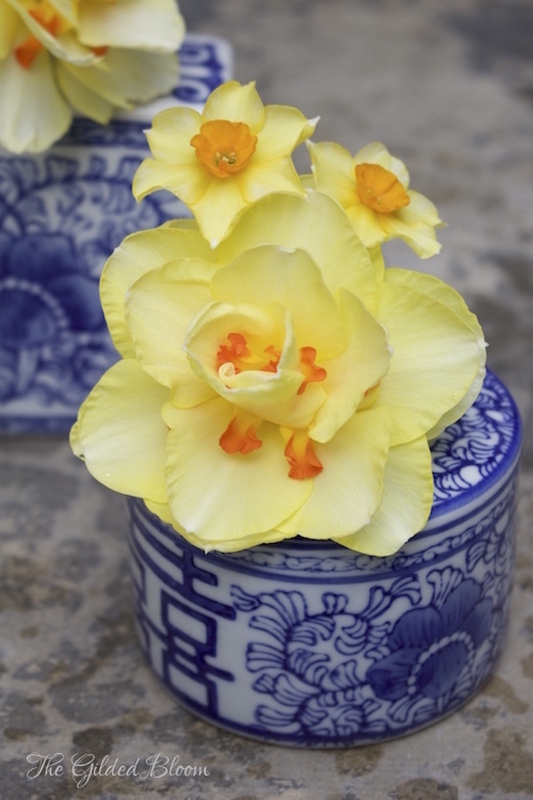 This blue and white porcelain tea jar provides a rich textural backdrop for the orange and lemon yellow "Tahiti" daffodil. This double blooming variety with layered petals is one of my favorites and its exotic coloring fuses beautifully with blue and white. Here a larger jar holds multiple blooms. The Tahiti and petite daffodils are excellent companions in the garden and also in arrangements. Enjoy!